Probably Peltigera apthosa, this foliose lichen is often found growing among moss beds on the ground. 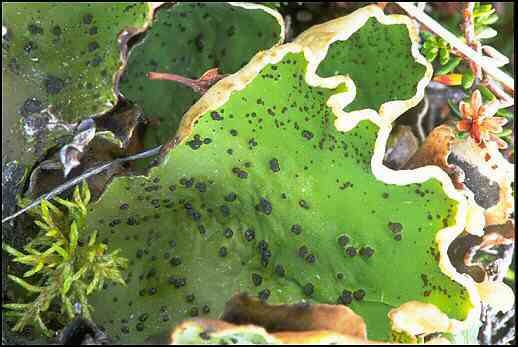 The dark "warts" on the thallus surface are called cephalodia and house cyanobacteria (typically Nostoc). The bacteria uses atmospheric nitrogen to form ammonium which can then be used by the lichen. Lichens of this type are a symbiosis of three organisms from three Kingdoms-- a bacterium, an algae, and a fungus. According to Hale (1961, p 87) This lichen was used as a remedy for rabies during the Middle Ages. "A widely used prescription for the treatment of rabies caused by rabid dogs called for a half ounce of powdered Peltigera mixed with two drachmas of black pepper. This mixture was taken on 4 consecutive days in a half pint of warm milk. When Linnaeus named this particular lichen in 1753, he called it Lichen caninus, the dog lichen."